The new hybrid rocket was launched on Thursday the 27thof September 2018 at 14:16 local time from Andøya Space Center. The 9 meter 800 kilo Nucleus reached an altitude of 107,4 kilometers in less than 3 minutes. 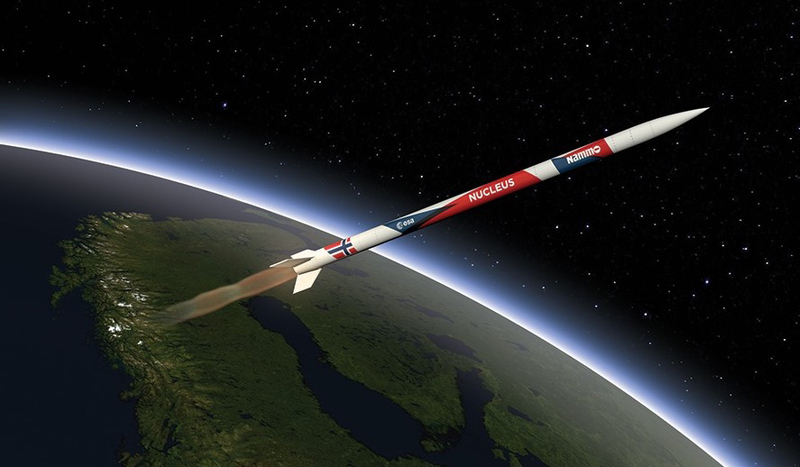 It is the first sounding rocket that is fully developed and built in Norway. After its suborbital flight, Nucleus splashed down in the Atlantic Ocean, 180 kilometers off the coast of Northern Norway. On this demonstrator flight Nucleus carried electronics that transmitted flight data for further analysis and six small experimental payloads that were ejected at altitude. Nucleus is developed and built by the Norwegian company Nammo in partnership with the Norwegian Space Centre and the European Space Agency ESA’s Future Launchers Preparatory Programme. The hybrid rocket’s oxidizing substance is a highly concentrated liquid hydrogen peroxide that is mixed with a synthetic rubber-like solid fuel. These chemicals are non-toxic, non-explosive and remain separate inside the rocket until ignition, which reduces the cost of launch services. With the byproducts of Nucleus’ combustion being mostly water and CO2, the new Norwegian rocket engine is more environmentally friendly too. -Without the support from the Norwegian Space Center and ESA, the Nucleus project would not have been where it is today, says C.J. “Onno” Verberne, Vice President of Business Development Space at Nammo. The technology developed in the project has already found commercial use in Nammo’s attitude control systems for European launchers. -The Norwegian Space Centre has supported the development of Nucleus from the start because this technology fulfills a clear need both in Norway and in Europe, says Geir Hovmork, Deputy Director of the Norwegian Space Centre. The next step is to build a larger motor to increase thrust, extend burn time, and reduce weight and cost. This development will be supported by the Norwegian Space Centre and ESA. Nucleus will make up the core of a hybrid launch system for small satellites, already a large and growing market world-wide. Andøya Space Center aims to become Europe’s dedicated launch site for small satellites and other small payloads.